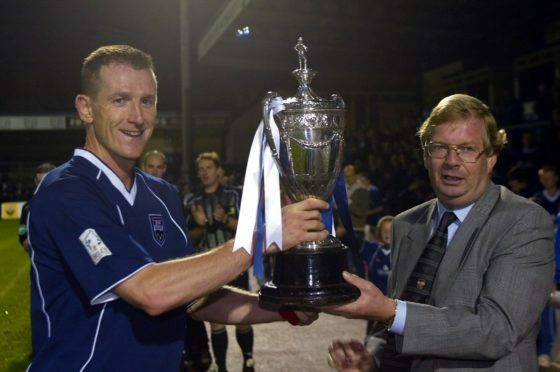 Former Ross County captain Brian Irvine believes Steven Ferguson was destined for a career in management. Former Ross County defender Brian Irvine reckons his former Staggies team-mate Steven Ferguson is destined for a successful management career. Midfielder Ferguson’s period with the Staggies between 1996 and 2003 coincided with Irvine’s stint at Victoria Park, during the club’s early rise through the lower divisions. Ferguson was appointed as co-manager at Dingwall alongside Stuart Kettlewell in March, with the pair taking charge of their first Highland derby encounter against rivals Caley Thistle on Saturday. Irvine, who won nine caps for Scotland, believes the 41-year-old has the credentials required to thrive, and reckons bigger clubs could come calling in the future. Irvine said: “I’m really pleased for Steven. He’s developed and learned his job and he’s a respected manager. “He was a great player and team-mate. For me he’s got all the qualities to become a great manager, along with the experience and qualifications he has picked up over the years. “There is no doubt he will be a good manager in Scottish football in the years ahead, whether it’s Ross County or another club he’s at. Derby success did not come often during Irvine’s period with the Staggies however the former Aberdeen player’s fondest memory of the fixture shortly before his four-year spell at the club ended, in a resounding victory in February 2003. Irvine added: “Inverness probably had the upper hand against County, but we registered one of the best ones in the 5-1 victory at Caledonian Stadium. That one still rings in the memory quite strongly. “Generally they were tough games – like any derby you could never really predict what way it was going to go. “When I played both clubs were in the lower leagues and played a number of derbies in the Championship. “A lot has happened since then, both have been in the Premiership, but even though they have both been relegated I think it’s just a matter of time before they will be back challenging there. “This Saturday has a bit of added spice with it being a top-of-the-table clash, with both teams having started the season well.